Completely Custom Lighting Fixtures... in Every Way! With Custom Lighting Company, you can take advantage of our many Custom Options. Perfect for interior designers, architects, builders, even homeowners can basically design your own coordinated lighting fixture theme based on our hundreds of light fixtures models. WHAT CUSTOM LIGHTING OPTIONS ARE AVAILABLE? Since founding our company in 2001, we have spent a good deal of time researching the lighting styles of eras gone by and we pride ourselves on “getting it right" for every one of our clients, whether the general home owner or famous celebrities. Our lighting fixtures are not available anywhere else! You will also not find any other company's products within our catalog. Custom Lighting Company is the only place where you can customize your selections from measurements, glass shades, metal finish, back plates, arm length, holder style, arm and tubing style, and more... down to the smallest finial. This is especially important when trying to create a lighting theme, from fixture to fixture, within the same room - or from room to room - as we can coordinate all of your lights to match each other, from a single bathroom light fixture for a home, to an entire hotel worth of lights. Choose a bathroom lighting fixture for your bathroom wall and we can design a matching ceiling light if you like, all with the same design theme - metal finish, holder, glass shade, tubing, etc.. 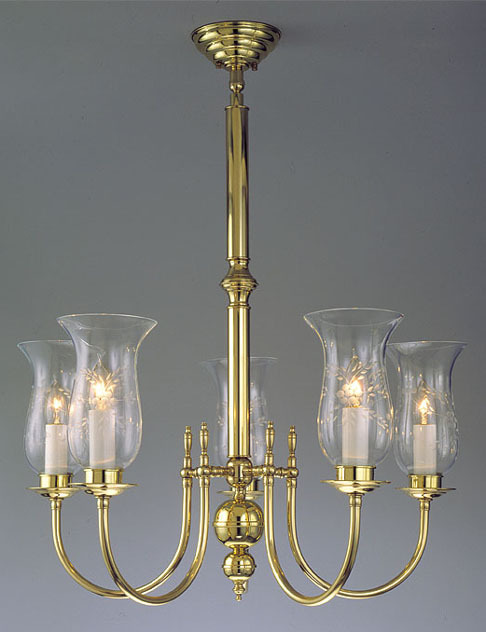 Starting from solid Italian and/or Greek Brass, the hundreds of period accurate lighting fixtures you will see within this website are shown as base models and are available as they are. They can also be modified in MANY ways to suit your individual tastes and/or spatial requirements. Since CLC offers “Custom” antique reproduction lighting fixtures, we would like to explain what Custom Options are available to you. A key feature in the design of our handcrafted lighting fixtures is your choice of Metal Color(s) or even using a combination of different metal finishes on the same light fixture. There are many to choose from. We suggest calling us Toll Free while you are on our website so we can help you choose the right metal color and other Custom Design Options to suit your taste and era. Polished Brass and Pewter - an elegant touch more towards the Old English look. Used predominantly in the early English times in the country. Click here for an example. Antique Brass and Pewter - The Country French look, a style you might find on the French country side maison. Vary applicable when creating a country or even Victorian look. Click here for an example. You are free to request any metal color combination and of course our experienced designers will advise you on what we feel is the proper finish for the period you are after. PLEASE NOTE: If your selection(s) is pictured in a different metal color than you desire, the price may increase or decrease, depending on the desired metal color(s), fixtures(s) ordered and quantity of order. 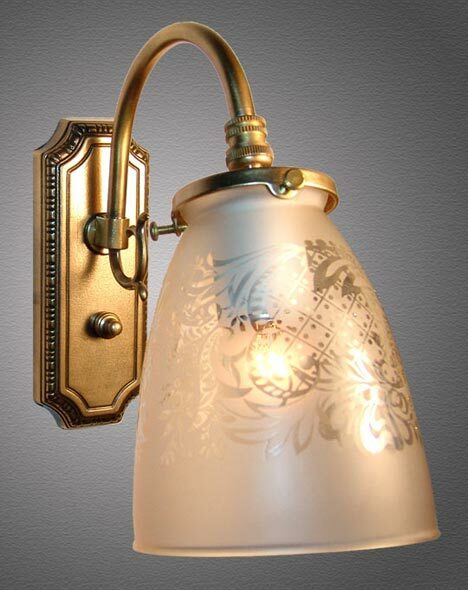 Our fixtures are designed to reproduce the antique lighting styles. It is our goal to design these reproductions as accurately as possible. Through careful research, we have decided on many different glass styles, designs and sizes which are often interchangeable on almost all of our lighting fixtures and which add realism as we reproduce the many period lighting fixtures we offer. Many of our glass shades are imported from France, Italy, England and Spain; many of which are hand blown and/or decorated. If you see a lighting fixture which has a glass not suitable to your tastes or spatial arrangement, peruse through our many Glass Choices to find a more suitable shade. Glass shades are not included in the prices shown and will vary depending on several factors. The fitter size of the glass - or the edge of the glass which sits in the holder - will vary from 2", 3" or 4". We have several glass shades that reach the 8"-14" fitter size, usually used on flush mount Short Ceiling Fixtures. Since we hand craft our lighting fixtures with varying sizes of glass shades, you can alter your selection (which might use a 2" fitter) to accommodate your glass choice which requires a different sized fitter. Please keep in mind that we might need to alter the dimensions of the entire lighting fixture to accommodate your glass shade customizations. We also have many lighting fixtures designed with Fabric Shades. This means if you see a model you like but it is designed to hold glass shades, you can inform us and we will modify it to accept fabric shades or vice versa. Please note: Altering glass or switching from glass to fabric or vice-versa might raise or lower the price of your selections. It is always best to call us Toll Free while you are on our website to speak with a designer who can help you. We offer several different tubing styles which are available in different diameters. You may use one style or interchange the tubing styles within the same fixture. Our tubing styles may be used on our chandeliers, wall lights, sconces, bathroom lighting, kitchen lighting, pendants, or just about any other light we carry. You are free to choose the tubing style and diameter you like, but we will advise you when you call as to what we feel would best suit the era and design you are after. Smooth Tubing - This is our basic smooth tube which comes in sizes ranging from 3/8" up to 1 1/2" - although the larger diameters are usually reserved for center stems on our chandeliers. Reeded Tubing - This is also called grooved tubing and resembles a Greek or Roman column. Also comes in 1/2" up to 1 1/2" - again we reserve the larger diameters for center pipes on chandeliers. Rope Tubing - Resembles a brass rope which is used exclusively on arms and center stems. Diameter sizes range from 1/2" up to 1 1/2" with larger diameters again for center stems. Our Tubing is completely interchangeable from fixture to fixture. If you see a fixture on which you would like the tubing to be altered in size or style, please inform us at the time of your order. It is always best to call us Toll Free while you are on our website to speak with a designer who can help you. All of our lighting fixtures are displayed on our website with some form of overall width or diameter measurement. These measurements are set only as a guideline and of what is most often recommended. You are not limited to keeping the dimensions shown. In fact, you are free to have your selections be whatever arm length you desire, so long as it is structurally sound. If you would like to alter the arm length of a fixture, for example, just tell us so at the time you place your order. We will advise you as to the best length for your particular situation based on your decor and/or spatial requirements. If you see a model displaying 3 arms and would like it designed with 5 or even 10 arms, this too can be done. Or we can go the other way and reduce the number of arms. We can even add an extra down light as shown here in our beautiful 6 light Victorian Chandelier Fixture Model C27. This model, shown with 6 arms, also uses an oval configuration whereby two opposite arms are longer than the other four. Many of our designs are made with tubing which can be cut at a custom length. Other fixtures us cast brass arms. We cannot alter the length of these but we can add tubing or decorative pieces which will extend the overall length of each arm. MOST LIGHTS OVER 6 ARMS REQUIRE A LARGER CENTER BODY FOR GREATER STRENGTH. NOTE: Altering your arm length or width, or changing the number of arms will raise or lower the price of your fixture depending on what is involved. Different rooms require different lighting applications. Your dining room may have a 12 foot ceiling while your bathroom is only 8 feet. We recognize this and also understand that personal tastes play a big part in customizations. When you place your order, we will discuss your ceiling heights to determine the best hanging length for your selections. Hanging Length (height) = The distance from your ceiling to the lowest part of the light. Altering the hanging length from what is shown on our pictures can alter the price of your selections. Adding length is usually a bit more while reducing length can save you a few dollars, however if you raise or lower the height within 6 inches or so, we will not charge more or less. A dining room table 12 feet long will require a wider fixture than what may be shown on our pictures - again depending on your personal tastes. It is our pleasure to accommodate this requirement for you. Just let us know the dimensions that the fixture needs to be and we will build it that way, so long as it makes structural sense. When you call in your order, we will listen and advise, based on your decor and the spatial parameters, which we need to work within. Fixture Diameter (width) = The distance across two opposite arms, from the outside edge of the glass or fabric shades. Some of our lights also show Oval Measurement. Put simply, if you draw an imaginary line connecting the ends of each of the arms, they will not be in a circular pattern but more in an oval shape. This is an excellent feature - especially for rectangular tables - which can be incorporated into our four, six, eight, ten or twelve arm hanging or ceiling lights. Using an Oval Configuration works best with oval or rectangular tables whereby the longer arms of your fixtures are pointing towards the head and foot of the table. This oval shape can be customized as per your requests. First, many homes and commercial buildings have irregular or sloped ceilings. This ball joint will keep the fixture hanging perfectly straight anywhere it is hung. Secondly, suppose you accidentally bang into your new kitchen island fixture. With our ball joint in place, the fixture will move if it is struck by an object reducing the damage and absorbing the shock. Third, even after it is mounted, the ball joint allows you to spin the fixture to the position which is most to your liking. If the ball joint was not in place and the electrical box in your ceiling did not perfectly line up with the mounting hardware for example, you might possibly be stuck with IE a two arm kitchen island pendant whose arms are off angle or even perpendicular to the island's length instead of parallel. If you prefer not to have the ball joint installed, simply tell us so at the time of your order. 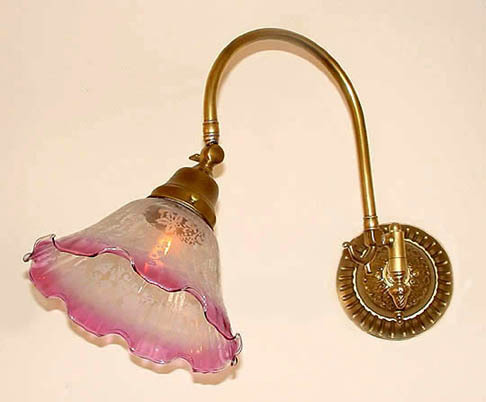 A feature of antique lighting is, in some instances, moveable glass. We can install a smaller Ball Joint, or a swivel, above a glass holder which will allow you to move the glass around a 15 degree radius. Another is a 5 position locking “key” which will adjust the glass shade's outward angle on more of a tilt. Please inform your representative or designer that you wish to have this feature installed. This feature works especially well on our wall sconces especially bathroom lighting fixtures. In many cases, a wall sconce is used to showcase a work of art or plants. A swivel will allow you to direct the light a bit more where it is needed. Roll your mouse over Wall Light Model NS2 or swingarm Model S67 for a larger view of each. We can configure the arms of your ceiling light fixtures or wall sconces so that the glass can face up or down. While this cannot be done on all of our fixtures, the majority of them can handle it. 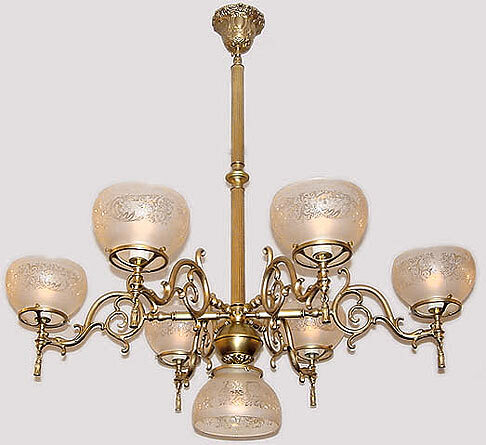 You can also alternate the shades on a four arm chandelier for instance with two up and two down. However, some of our glass holders do not use thumb screws to hold them in place. Rather, the glass simply “sits” in a cup holder using gravity to keep it seated. Turning the arms of this type of light upside down is not advisable as the glass will fall out of the holder. We can add a switch to any of our lighting fixtures. The switch will usually be installed on the canopy (or the sockets themselves) and will be in the metal color of your fixture. We can also install an on/off switch on the wire leading to the socket such as is used on a table lamp. Or we can install a socket which includes a regular on/off switch. This configuration is most common on floor and table lamps. Some customer have requested pull chains which is also most common on table lamps but can actually be installed on any style fixture including bathroom lighting and kitchen island pendant lighting. Please take care when considering pull chains. This requires downward force which places extra pressure on the connection point of the arms at the center body (on chandeliers) or on the wall plate (on sconces). For this reason, it is not advised to use pull chains on light fixtures with longer projected arms.